We are a leader in sealcoating industry and are constantly looking for new ways to improve our service. We have served 1,000’s of driveway sealcoating customers in and around Round Lake Beach, IL over the decades, and our reputation for being the cleanest and neatest asphalt sealcoating company stands above all others. We pride ourselves on our reputation as being the leader in the asphalt sealcoating industry and our customers know it too. We also offer sealcoating services for public roads and neighborhood streets and have completed many road and street projects in and around Round Lake Beach, IL. We are also very experienced in repairing drainage and sewer problems which require different solutions depending on the specific needs and grading issues. We use proper equipment, the best materials, and correct application methods to ensure proper adhesion and long lasting results. 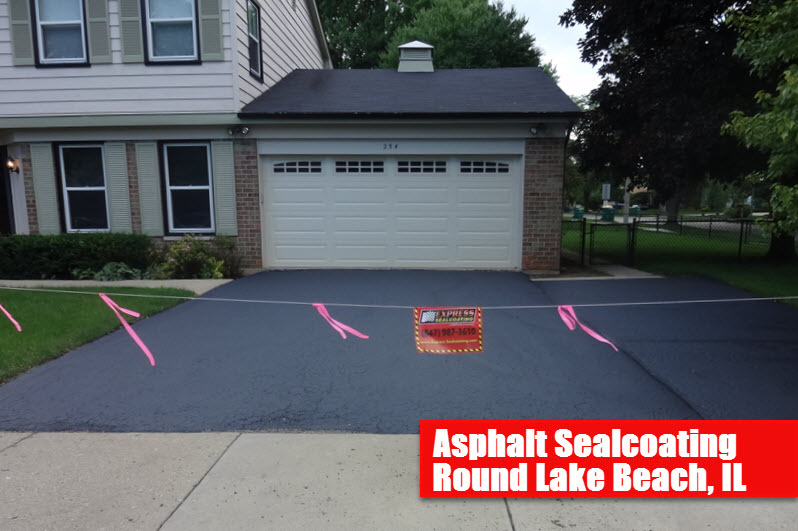 Our Asphalt sealcoating and driveway sealcoating services in Round Lake Beach IL include treating Oil spots using a propane torch to lightly dry out the oil and then apply a high grade oil primer to improve adhesion of the sealcoating. Neatly brush apply 1 coat of 100% the highest quality Coal Tar sealer manufactured by Gem Seal, formerly Sakrete. (Silica sand is evenly mixed with the sealer for added Traction and Durability). Thorough cleaning of the entire asphalt surface and in cracks using wire broom to loosen up dried dirt and debris and then high powered blowers to clean off all dirt and debris. Round Lake Beach’s Top Asphalt Sealcoating Company!